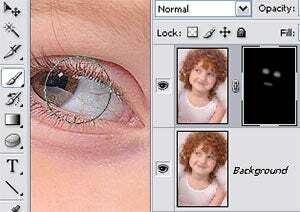 One way of drawing the vieweru2019s attention to the most important parts of a photo, such as the eyes in a portrait, is to apply a little localised sharpening to these areas. Now many photographers would be on the right track in thinking that all I need to do is select the areas that I want to sharpen and then apply a sharpening filter to the selection. 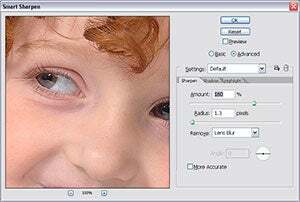 Yes, this approach will give you the desired result but it has two problems - one it is a destructive technique as it changes the original pixels in the process of sharpening and two, it allows little room for error or fine tuning. So, letu2019s approach the problem from a different angle. 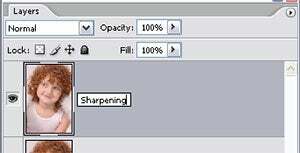 To start, we duplicate the image layer and apply our sharpening to this layer. Next we add a mask to the sharpened layer and use this mask to control where and how much sharpening is combined with the original photo. Cool! 01 Commence the technique by duplicating the background or image layer using the Layer > Duplicate Layer option or by dragging the image layer to the New Layer button in the Layer’s palette. 02 Next make sure that the Sharpening layer is selected and use one of the sharpening filters to sharpen the layer. Now add a layer mask filled with black to the Sharpening layer. Do this by selecting the Layer > Add Layer Mask > Hide All option. As the mask this action produces is black, it hides the upper layer totally. 03 Now comes the fun bit. Click on the mask thumbnail in the Layers Palette. Select the Brush and make sure that the foreground colour is set to white. Adjust the Brush’s opacity setting to 20-30% and then start to paint over the areas that you want to apply sharpening to. The white paint on the mask will reveal the sharpened upper layer. Elements doesn’t have the same layer masking options but similar results can be obtained by erasing portions of the sharpened layer that are not needed.